With St. Patrick’s day just around the corner, no city embraces its Irish heritage quite like Chicago, and with this heritage comes tradition to follow. In just a few weeks, Chicagoans will gather at Wabash Avenue and Columbus Drive and watch as 40 pounds of orange powder are dumped into the Chicago River. As a tradition that has come to define Chicago’s unique, diverse background, it’s fair to ask: How did the dyeing of the river come to be? In 1962, Stephen Bailey—a member of the Chicago Journeymen Plumbers Local Union, and his childhood friend and former Chicago mayor Richard J. Daley—began the tradition. During Daley’s term in office, he pushed for several redevelopment projects to limit waste in the Chicago River. Here, city workers used a green dye to find extraneous waste in an effort to identify those who were illegally disposing into the river. As the projects continued, Bailey (who was also the chairman of the Saint Patrick’s Day Parade committee) came to a realization that would go on to further symbolize Chicago’s reverence for its Irish roots: Dyeing the entire river green on the morning of the parade. After 50 years of the river dyeing, the actual process has recently undergone modifications to better serve the environment. According to the Chicago Tribune, compared to the original powder, an “environmentally friendly” powder is now used to give the river its emerald tint. However, the actual ingredients are top-secret. Following the deposition of the powder by boat, a smaller boat closely follows the path of the head boat, allowing the water to spread to either side of the river. After about 45 minutes, the skinny green streaks spread widen, allowing the whole river to appear green. By the next morning, after the St. Patrick’s Day festivities come to an end, the river maintains its new color for several days. 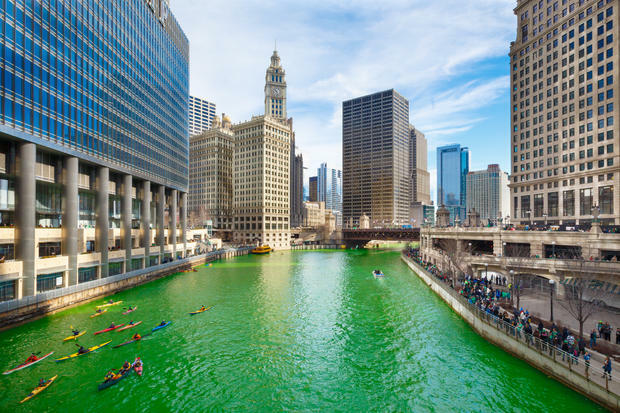 Similarly, the tradition of the St. Patrick’s Day river dyeing has stood the test of time, remaining as one of the city’s most idiosyncratic customs.